Chi Oriental Restaurant / B&B Bed and Breakfast accommodation in Kenton near Exeter, Devon is a family run business, serving fine oriental and fresh seafood in the picturesque village of Kenton south of Exeter and a few minutes walk from Powderham Castle. 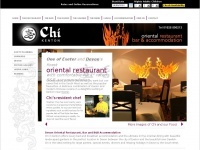 A profile of Chi-restaurant.co.uk was found on the social network Twitter. The web server with the IP-address 104.18.46.96 used by Chi-restaurant.co.uk is owned by CloudFlare and is located in San Francisco, USA. This web server runs a few other websites, mostly in the english language. Only a few websites on this web server are x-rated.